Out tutoring last night, then woke up SO painfully engorged at 6:30 - 12 hours since I'd nursed anyone: eek! Chills, fever, and a bunch of tylenol/ibuprofen later and I'm starting, STARTING to feel human again. Called mommy to beg her to make us supper, but she was out & hasn't phoned back, so I guess we're on our own, and I'm okay to make it as long as the littles don't bug me too much. Umm... supposed to be beef/veg soup but no veges in the house. Urgh. Remembered today that I invited the parents for Shabbos dinner this week, AND Judy, and now Sara... oh, well; that's only 4 extra and Sara will be here to help cook! Oh, and guests for lunch, too. Can't just have ONE person; we have to invite a million at a time! If you think that's not a problem, well, you've never seen our living room. Dug up these costumes on Sunday. 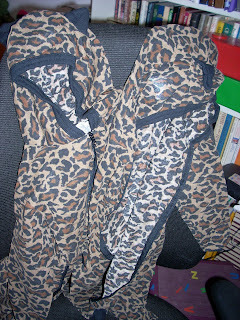 Mary bought them for YM & EC when they were babies; size 2 and size 3 matching leopard costumes. It's a cheapo copout but I am thinking of zipping Naomi into one and having Elisheva do her face. She's both excited and nervous about "being a cat for Purim." We've started practicing Mah Nishtana! She said today, "at Pesach I will stand up at the table and sing Maoz Tzur." I reminded her that Maoz Tzur is for Chanukah time and she got flustered and embarrassed. She actually remembers most of it from last year - amazing! Must run while the littles sleep.